The camp of Red Dead Redemption 2 is basically your only safe haven in the whole game, so you're going to need to make sure it's in good condition and everyone's happy. In this Red Dead Redemption 2 camp guide, we'll be putting together all the information you need to know about the way the camp functions, including how to keep all your companions happy. If you need anything else on Rockstar's latest game, you can head over to our Red Dead Redemption 2 guides hub. It's on this main page that you can find a beginner's guide, tips and tricks, and much more. It's only after you've made it through the prologue section of Red Dead Redemption 2, that takes place in the snow, will you have access to your first camp. This is going to act as the hub of life for your gang of outlaws, all throughout Rockstar's massive game. All throughout Red Dead Redemption 2, you're camp is going to have a ledger. 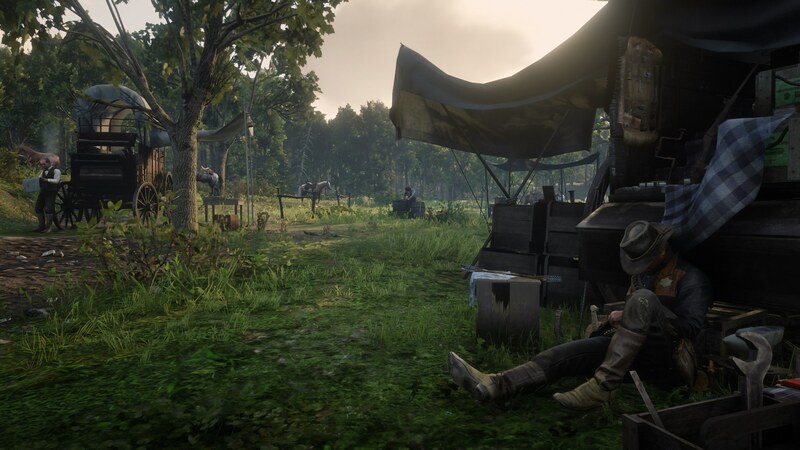 Every time you ride into your camp, you'll get a notification about how much money your camp has saved up in the top right corner of the screen, and this represents the money that Arthur and everyone else has pooled together. Can the Camp in Red Dead Redemption 2 be Upgraded? You can do a lot of work to make your camp in Red Dead Redemption 2 better. If you want to upgrade your camp, you need to head over to the suitcase with the dollar icon on the mini map. Here, you can spend the camp money on new upgrades, such as new medicine, food, ammunition, and more options. For a full walkthrough of every upgrade option available to you in the game, head over to our Red Dead Redemption 2 camp upgrades guide. Whenever you're in the base camp in Red Dead Redemption 2, you'll see a few icons in the top right of your screen. There's an ammo meter represented by the bullet, the medicine meter represented by the white cross, and the food meter, shown by the fork. It's your job to keep all these meters showing white. If they show white, it means you've got enough of these resources to go around, but if they fall to red, this is when the morale of your camp can decline. If you ever need to replenish any of these resources, head over to the ledger, and use the 'Restock' option under the food, medicine, or ammo options to completely refill your supplies, and keep everyone happy. 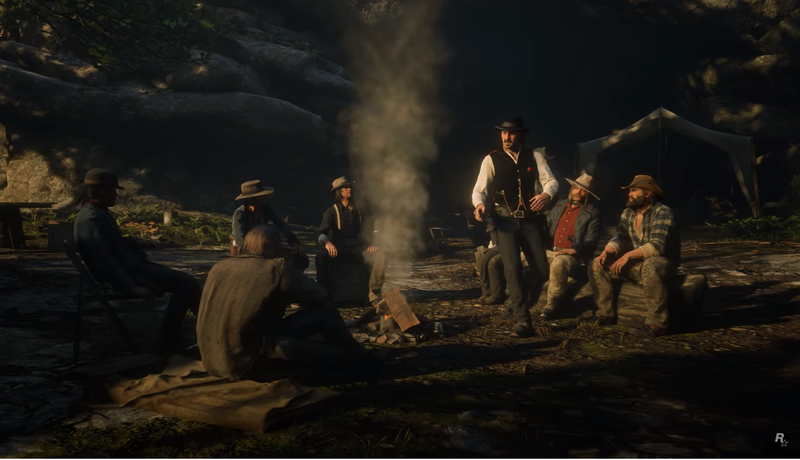 While there isn't an actual meter for the overall camp morale in Red Dead Redemption 2, people are going to come up to you and have a word if they aren't happy. Basically, if you don't hear anything, assume everyone is happy, and while they are happy, they'll be more inclined to donate their earnings to the money jar, thus earning you more money to spend in the ledger. This is everything you need to know about your base camp in Red Dead Redemption 2. You can now head over to our other guides on the game, including our page on how to dual wield in Red Dead Redemption 2, or our Red Dead Redemption 2 Cheats guide for more. Tagged with Action Adventure,	Blockbuster,	Guides,	PlayStation 4,	Rockstar Games,	Role Playing Games,	Story Driven,	Xbox One.